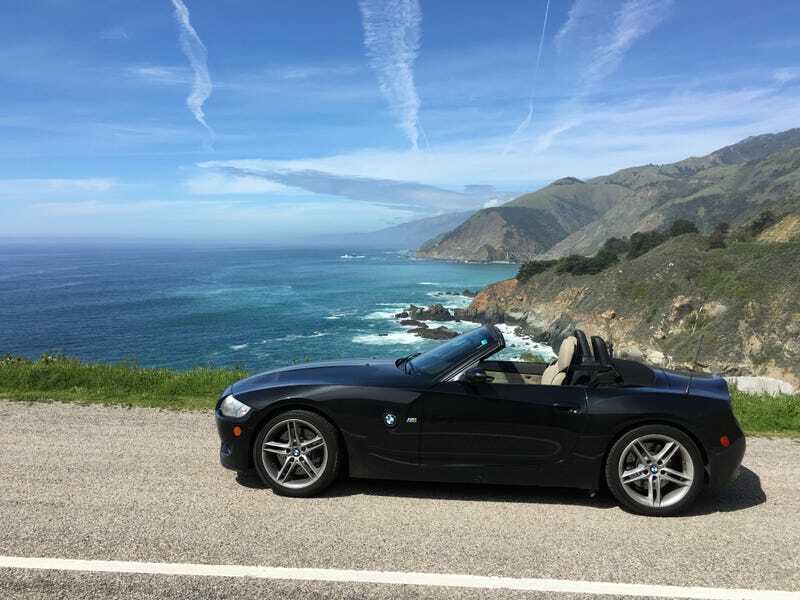 picked up this sweet little 2006 Z4M for a long weekend cruise from LA, through santa barbara wine country, up pch, through big sur, carmel and monterrey, and then back down through the center of the state (avoiding i5). she (correctly) wanted a convertible for the trip. but one must really pack light for 4-5 days in this tiny thing. getting the trunk and storage bins set to drive was like a game of tetris, as we added various bottles of wine and knick knacks along the way. while every other car driving up or down 1 was a mustang or camarao convertible, we felt special in this little six speed. it has the engine from the e46 m3, and it sounds a charm, but i think i was expecting it to have a little more torque. with around 330 hp (if i’m remembering correctly) i thought it would feel a little more powerful than it did. makes me think an m3 would even feel sluggish with its added weight. somewhere in the middle of the state. some of the less traveled roads in the state. and a few of our bovine friends for good measure. anyway, great trip, great car. D: if you happen to read this, thanks for the ride! hopefully i’ll be able to make it again someday.